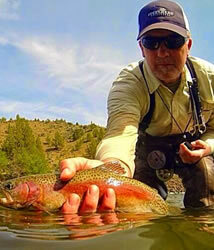 Here at Gorge Fly Shop we all love the outdoors! Fact is we are all expert anglers and many of us have worked as professional guides. Our crew has countless days fishing locally as well as around the globe. We are a culmination of experiences and knowledge with a willingness to share. The expert advice page is here to help you find that individual that has specific knowledge to help you answer questions about fishing a particular style, species or location. Email the expert you think can best give advice for your fishing needs. We'll be happy to talk fishing. Need some friendly, professional advice? We would love to help. Simply email your questions to the GFS Team Member who best represents your needs for some prompt, accurate answers! Travis was born and raised in Hood River Oregon, where he still resides. Growing up with some of the best Steelhead fishing in the world, Travis' love for pursuing Steelhead started at an early age. 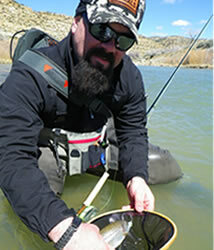 This passion for the sport of fly fishing and chasing Steelhead with a fly rod developed into a career in 1992 when Travis opened the doors February 29th to The Gorge Fly Shop. Shortly after Travis started guiding clients for summer and winter Steelhead on many of the great tributaries to the Columbia River in the area. 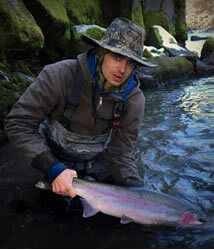 With guide experience and owning Gorge Fly Shop Travis has helped clients all over the world, helping them fill their dreams of catching Steelhead on a fly rod. Warm water Species is where I consider myself an expert. I have been pursuing Bass, Crappie, Bluegill and Walleye all my life. Between my hometown of Cincinnati, Ohio, north to Lake Erie and beyond into Canada is where I have gathered most of my experience. Since moving to the Northwest and starting my career with GFS in 2007 I have built my reputation for being a bass pro on the mighty Columbia River. I can't explain the hold on me the passion for these warm water species but it exists and thrives no matter where I go. So if you have ever wanted to take a Bullgill on a 3wt or tease a smallmouth to the surface with a giant popper than we share the same passion and I would be thrilled to share my knowledge with you for your pursuits. Today Steelhead gets much of my attention and swinging flies with a Two Hand rod has further advanced my skills. I now find myself using these tools in the pursuit of Trout, Bass and any other species I think I can swing a fly to. The passion of fishing involves discovery. Its a lifelong pursuit! I started working for Travis about 5 years ago after retiring from a 23 year salmon & steelhead guiding career, I have known Travis since he opened the Gorge Fly Shop back in the day. 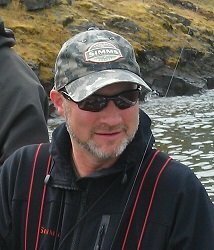 Through my guiding and angling experiences I have gained a wealth of knowledge in our local Oregon, Washington and some Alaska waters. 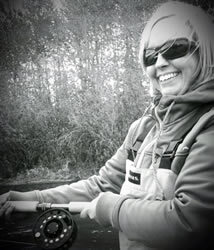 Although fly fishing has always been a passion of mine I'm also knowledgeable in Gear and Center pin fishing. A local grown fisherman, I have been fishing these waters since high school in the late 70's, if you couldn't find me in the basketball gym you'd find me on a river somewhere. The last five years at the shop have been wonderful for me, allowing me to stay active in the industry and help others pursue their passion of fly fishing. Give us a call it's easy to talk about something you're passionate about! Oh yeah, I like sweet tea, getting caught in the rain and long walks on the beach. Mike was raised by a pack of wolves... The reason why he never shaves. Wait No... Mike was born and raised in Hood River and had the wonderful opportunity to experience the vast variety Oregon has to offer. From the Mountain streams to the desert parts of the state. 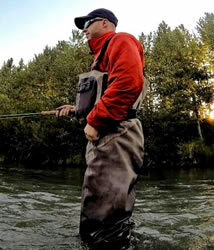 Mike has been with the Gorge Fly Shop for at least a decade maintaining all things web and tech related. His passions besides being a webmaster include hunting, fishing and going to what he calls "Church (4 wheel drive required). When it comes to fishing he still considers himself a newbie but always willing to learn something new. He has a passion for Bass and Trout but always eager to chase something new or to implement a tactic he has never used before. Besides his crazy kids, kayak fishing and utilizing his new Stealth Pro are high on his passion list. If you have a issue with your account or notice a problem online, Mike is our go to guy. Gabe has been around the shop in some capacity since birth or at least since he could fish. Gabe is not your average angler. While still a young man he has hooked more fish than most of us could only dream of. He is a young man possessed. If he is not busy fishing he's usually in the shop. Next time you see him ask him where he's been, how are the water conditions. I married Travis just over 13 years ago. I used to live in Vancouver Washington. I worked at a doctor's office there and a wonderful friend and co-worker set me up on a blind date with Travis. This is Dan Gordon's daughter, Carrie. I know, small world. We have been together ever since and we have two beautiful children. Our daughter Maddisyn is almost 11 years old and our son Austin is 8 years old. As of almost 7 years ago I left my job at a local OB/GYN office to work here at Gorge Fly Shop. I know, some of you may think it's hard to work with your husband but we work really well together and I would not have it any other way. I first started doing a little bit here and there but eventually was on the desk position processing orders, payments, answering questions and such. I loved doing that job however, it was really hard for both Travis and I to be gone at the same time. Patty started working with us just over a year ago and is doing a fantastic job which enables Travis and I to get away together more. We are so happy and proud to have such fantastic employees. Prior to meeting Travis I had never fly fished before. He shared his passion of this sport with me but after our daughter was born and then our son as you can understand my fishing time was cut short. Now, they are older I get to fish more. Besides I am spoiled and get to fish with John Garrett, Tom Larimer, Sam Sickles! This year, September 2015 was my first overnight trip on the Deschutes. It was amazing. I was fishing with a spey rod and landed my first two Steelhead all on my own. Well with lots of guidance from Sam Sickles. I had such a fantastic trip that I can't wait to go back. I would have never imagined as a young adult that I would be where I am at today but I would not change a thing. I'm blessed with a loving husband, kids and my passion to keep Gorge Fly Shop growing! Thank you for shopping with us and becoming part of our family! Have a Question? The GFS Team will find the answer.